Earthquakes, wildfires, and extreme heat are all facts of life in our area. Most families know they need to have a plan in place in place if disaster strikes. It's important not to forget our pets when planning and preparing for an emergency. Keep collars and leashes near your front or back door (whichever you use more frequently or even at both) in case you have to evacuate quickly with your pet or firefighters need to rescue your pet. Have pet carriers ready that are the correct sizes for each of your pets. Make sure each carrier is labeled with your contact information, should you become separated from your pet. Write down the number of pets inside your house and attach the sticker to a front window where it can be easily found by emergency responders. This critical information saves rescuers time when locating your pets. You can obtain a free window cling by going to www.adt.com/pets, or from the AKC (www.akc.org) and the ASPCA (www.aspca.org). You can also pick one up at your next visit to Nordhoff. Firefighters are familiar with pet alert window stickers so keep the number of pets listed on them updated. Knowing the accurate number of pets in the house aids rescuers in finding all of your pets. Evacuation shelters generally don’t accept pets and for this reason it’s important to plan ahead to ensure that your pets and family will have a safe place to stay. Research hotels and motels outside your immediate area for pet policies and ask friends and relatives outside the area if you and your pets can stay with them in case of a disaster. Having your pet licensed AND microchipped can protect your pet and help identify them if they were to become lost. Also, keep your pet’s vaccinations current, and keep the records handy. Have a photograph taken of you with your pets to show proof of ownership should you become separated. 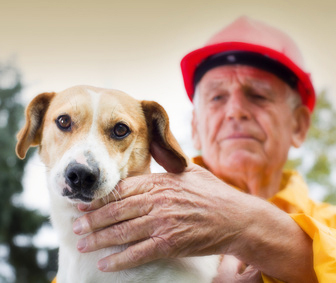 One of the most important things to do if you are evacuating your home is to take your pets with you because you may be forced to stay away longer than anticipated. In addition, leave early and don’t wait for mandatory evacuation orders because if emergency officials have to evacuate you, you might be told to leave your pets behind. A disaster may strike when you’re away from home. Make arrangements in advance with a trusted neighbor (who is comfortable with your pets and knows where in the home they are likely to be) to take them and meet you at a specified location. Have a pet emergency kit prepared and ready for a disaster. If roads are blocked due to a natural disaster, professional help may not be possible immediately so familiarize yourself and other family members with pet CPR, resuscitation and general first aid procedures. Your quick action could save your pet’s life. Contact 211 for information about evacuations ordered for your area. If you need to evacuate and cannot get to your pet, notify an animal control officer on site or contact the West Valley Center at (818) 756-9325 as soon as possible.